The third and final entry in Meowskivich's Donkey Kong ExstravaLandsa. Or, IS it?! Here it is. Pure cartridge goodness. 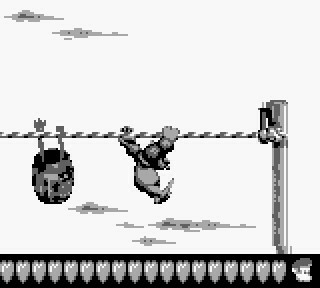 Donkey Kong Land III. Hello all, for the third in the Game Boy trilogy, reviewed and played by Meowskivich. Even though this game is on Virtual Console, I have the actual cartridge, and thus had to break out one of four consoles. Not wanting to sit up and play it on the TV because I don’t want to hook up my GameCube or SNES, I had no other choice but to play it on the Game Boy Color…in super awesome kiwi-melon palette! That’s pressing “right” on the D-pad when the game is loading. 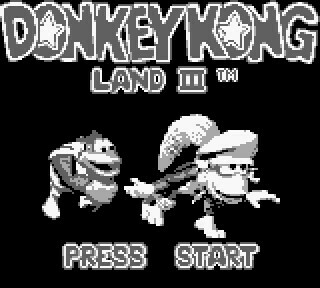 Starting things off, the world map (unlike Donkey Kong Country 3) is in the classic style of a set pathway you press a direction to go through, and it has clear paths through the worlds instead of haphazardly tossing levels about like DKC2/DKL2 did (which I forgot to mention, sorry). Only thing is, you won’t be able to tell where the actual levels are on the map all the time, as you’ll suddenly stop for a stage that happens to be in the middle of the pathway. I mean, it’ll tell you the name of the stage, and you’re not going to miss it, but it’s disheartening when you’re looking forward to that save point and then suddenly you’re stopped short and forced to play one more wacky level before you can take a break. As for the levels themselves, they’re pretty dandy. The frame rate seems the best of the games, and the sprite work is the best yet. The level graphics are often well-made, but they stick to the bright-end of the four shades of green spectrum, which makes the “Collect the Stars!” bonus rounds harder just for the sake of seeing the stars in the air. The worst tileset, though, has got to be the cliff-face one. It’s a little too detailed and thus makes everything hard to see. Design-wise, the levels are pretty solid. I don’t run into too many situations where I can’t see enough around, and there are invisible extra lives hidden everywhere, among other secrets, including THESE DERN WARP BARRELS. I believe in Donkey Kong Land 2 and Donkey Kong Land 3, every level has a hidden warp barrel to pretty much skip the level, but I’ve been running into the warp barrels in DKL3 pretty much all the time. They’re cool and all, but I’m trying to 100% the game. Animals no longer have their SUPER CHARGE abilities! Not that I used them too much in DKL2, which is probably why they were cut for the sake of space, but gone be they. Re-entering an animal morph barrel will actually act like getting a DK barrel. It’s a good thing to note for when you get hit close to where you morphed at, as you can just off-screen respawn it. I don’t think you can off-screen yourself to death like you could in DKL2 and easily do in DKL. I’ve tried deliberately to do it, but the camera does a great job keeping up with me. I miss my Y button. The Virtual Console for the 3DS lets you use Y as an alternative to Select, because pressing Select for Squitter the Spider’s webs to make platforms gets weird when you’re jumping through the air and pushing all the buttons. I often catch myself instinctively reaching for it when I desire to switch me Kongs, mostly. As for the hidden bonus barrels in the levels, how in the world did I find these as a kid?! I mean, most of them are fine, some just placed at the end of a split path (which drives me up the wall when the path gets long because then I start feeling I went the right way, which happens to be the wrong way in this case), plenty are “hidden” up a path of Nic-Nac enemies (which may as well be called “bonus this way”s), but there are some that are just placed in bottomless pits with, as far as I can tell, no hints as to their existence (especially when they’re down there AND INVISIBLE). I only KNEW of their existence this time from me having their locations burned into my mind. Perhaps the only way you can find them without a guide or feeling everything up sensually would be to use the store. Segue! In this game, you can collect bear tokens, and they serve, depending on your perspective, more AND less use than they did in DKC3! Make your way to Sheepy Shop in each world and you have three things made available. Per world, if you have a minimum amount of Bonus Tokens (it grows per world), you get to play a Memory Match minigame, which can yield prizes of an extra life, a bear token, a DK coin, some nanners, and a watch collectible for completing it. More on those later. Your first attempt at each one will be free, but further attempts (and any life farming you want to do from it) will cost five bear tokens. Next menu item, hints! This will tell you a random hint for one of the levels in the world you buy it in for two tokens, so if you need hints for one level, there’s a chance you’re going to be going in and out of this place for a while. Or you can be awesome, like me, and hug everything because you have too many lives anyway. Finally, there’s the item I almost didn’t know existed (and often forget): the teleporter! Conveniently, every bear in the DKL3 world happens to have an experimental teleporter they’re working on, and they all charge five tokens, and they all do the same thing: let you leave the world. Fine and dandy, but the archaic choice of having you have to say “Yes” or “No” to each item beforehand will leave this out of your mind since the only way to find it is deny everything else beforehand. If you want to leave the world for free, though, you gotta go through the boss. The boss fights are honestly…OK. That’s about the best I can say for them. They’re not bad, but there’s pretty much one trick to each of them. Basically, they do one thing, and each hit on them makes each follow-up pattern longer. My only real quip is that the two bosses you hurt by jumping on are a tad picky about it, as there are no physical changes in their beings to indicate that you can’t leap on them again. Well, one of them does change, but that’s only for one part of that boss’ pattern, he’s still picky when he’s normal-looking. So, once you get through the game by rolling at every goal post, suffering a serious lack of N64 in Wrinkly’s refuge, and amazing at how the late-game bonus barrel placement AND stage layouts both got rather lazy, you come to the end of the game. You fight K. Rool in an admittedly tricky-at-first true final battle, and beating him relinquishes unto you…six watches! … OK? Now, I don’t remember the story in the manual for the game too much, but I don’t really recall watches being important at all, honestly. The game talks about treasure being in this world, but the game sort of forgets about it. You get watches, and six more for a total of 12 (for some reason). I honestly have to half-wonder if they were originally going to use these/disperse these differently than they did in the final product, but there you have it. After getting these watches, you get to do a Time Trial mode, and Bob’s your uncle. I don’t know if there’s a prize for beating all these time trial records, and I can’t be bothered because it’s too hard, but that’s the end! All in all, I find the game to be pretty great! … OK, I only find the game to be pretty “good”. It’s the result of having two previous Game Boy games behind the developers, and having a refined system, and swell spritework. In the end, the bosses could have been better (could have been worse, too), but the levels themselves are pretty great in design. Lots o’ hidden stuff, good camera control and view distance, and decent length. And yes, for the inquiring minds, the music is pretty nice too. The timeless tale of the daughter of a Japanese prime minister and her bodyguards.